Before any newly designed airplane, chopper or rocket can take flight, it must first go through extensive testing in a simulated environment — and the only place in the U.S. where a full-size plane can go through that sort of test is at the U.S. Air Force’s National Full-scale Aerodynamics Complex (NFAC), an Arnold Engineering Development Complex test facility located at NASA Ames Research Center at Moffett Field in Mountain View, CA. 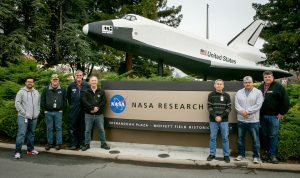 Ames is world-renowned for its cutting-edge work in the field of aerodynamics, and is capable of performing research, development and testing of aerospace equipment that would be next to impossible anywhere else. IBEW 1245 is proud to represent the electrical and mechanical workers employed by Jacobs Technology as well as the National Aerospace Solutions, LLC (NAS), a U.S. Air Force contractor that operates on site at Ames. The Local 1245 members at NAS also help to facilitate the testing of new aerospace equipment when it is brought in for a trip through the wind tunnels. 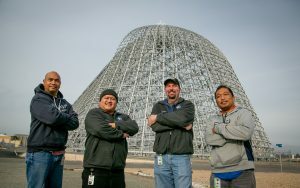 IBEW 1245 members (from left) Bart Aganon, Lex Alday, Craig Morrison and Louie Icari work for NAS at Ames. The wind tunnel is visible in the background. Building and maintaining the massive and powerful wind tunnel systems at Moffett Field is no small job. It takes an extremely skilled, meticulous and knowledgeable workforce to keep these remarkable simulations up and running. In an environment geared towards rapid technological advancement, human capital runs the risk of being neglected, which is why the workers at Jacobs and NAS are grateful to have the IBEW on their side. These workers were formerly members of IBEW 2131, a small manufacturing local which struggled for years to provide quality representation with limited resources. In early 2014, Local 2131 officially merged into IBEW 1245, and the 300 manufacturing members have been exceptionally grateful for the support that Local 1245 has provided. The IBEW 1245 members who work on the U.S. Air Force contract for NFAC support are fully funded through the Department of Defense. However, many of the 1245 members who work on the NASA side are being denied access to their worksites due to the government shutdown. If the shutdown continues for much longer, it could drastically impact these 1245 members at Ames, as well as tens of thousands of other workers employed by the federal government. Due to security clearance issues, members of the general public cannot enter Ames, so regretfully, the Utility Reporter was not able to capture images of our members at work inside the facility. For a glimpse inside Ames, visit NASA’s photo gallery at https://www.nasa.gov/centers/ames/orgs/aeronautics/windtunnels/arc-upwt-multimedia-index.html.